burn is a fire hazard. They can be very hot, causing burn injuries. 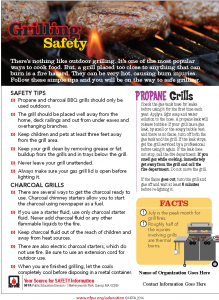 Follow these simple tips and you will be on the way to safe grilling. buildup from the grills and in trays below the grill. ☀ Never leave your grill unattended. the charcoal using newspaper as a fuel. flammable liquids to the fire. completely cool before disposing in a metal container.